Our research has shown that blue BioClip sensor had very low sensitivity and was almost useless in experiments. So we have decided to exclude it from the standard set of delivery of the Bio-Well device in order not to confuse Users. From October 2017 BioClip accessory is no longer shipped together with the Bio-Well device. 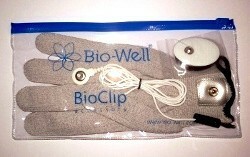 Bio-Well Glove will not replace it, but will be sold as a separate accessory like GDV Sputnik sensor or Water sensor. Standard price for Bio-Well Glove is 150$. If you will have any questions – please feel free to contact me by email, Skype, Whatsapp or WeChat. The Bio-Well Glove is designed for real-time measurements of a person’s stress level. Bio-Well Glove has two options: a conductive glove for one hand, or a sticky electrode which may be placed on any part of the body. Measurements are conducted in “Environment” or “Meditation” modes. Bio-Well Glove should be connected to the Calibration Unit supplied with the Bio-Well device.